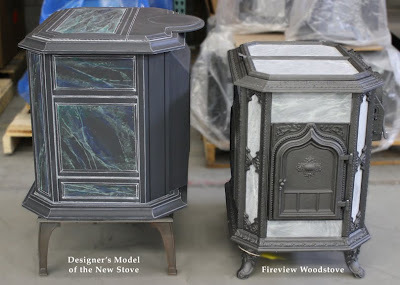 To give everyone a better sense of scale, we have a side by side rough comparison of our current Fireview stove and the Designer's Stove Model of the New Stove (both front and side view). This is not a perfect comparison. As you may notice, the body of the new stove is currently resting on the base of a Keystone/Palladian stove to give it the correct approximate height. 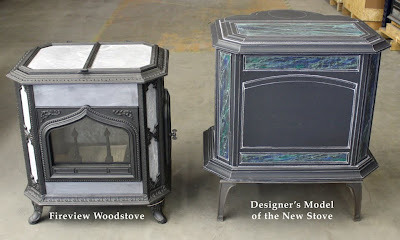 The stone effect is simply drawn in with the green/blue colorations and the real legs of the stove will be more substantial than what's shown. Thanks to feedback on our first few posts, we have incorporated an arched viewing window (see below). While we will not be using the figure head as an emblem on the stove, this will give you some idea of what we can do with new carving software (and it can be cast! ).